Our native Olympia oyster may seem small and meek, but its slow-growing nature may serve it well under future conditions of ocean acidification, according to a new study. In fact, the tiny Olympia oysters appear to reproduce successfully in waters that can kill the offspring of Pacific oysters — a species that grows much larger and provides the bulk of the commercial oyster trade in Washington state. Unlike Pacific oysters, Olympias don’t begin forming their shells until two or three days after fertilization, and the formation progresses slowly, helping to counteract the effects of corrosive water, according to the author of the new study, George Waldbusser of Oregon State University. Betsy Peabody of Puget Sound Restoration Fund said people who work with Olympia oysters have long suspected that they may have some advantages over Pacific oysters. Olympia oysters keep their fertilized eggs in a brood chamber inside the shell until the larvae are released into the water about two weeks later. In contrast, the eggs of Pacific oysters are fertilized in the open water and the resulting larvae must fend for themselves right away. While the brood chamber may protect the larvae from predators, the new study showed that the brood chamber does not protect against ocean acidification. Corrosive water still circulates through the mother’s shell, exposing the larvae. 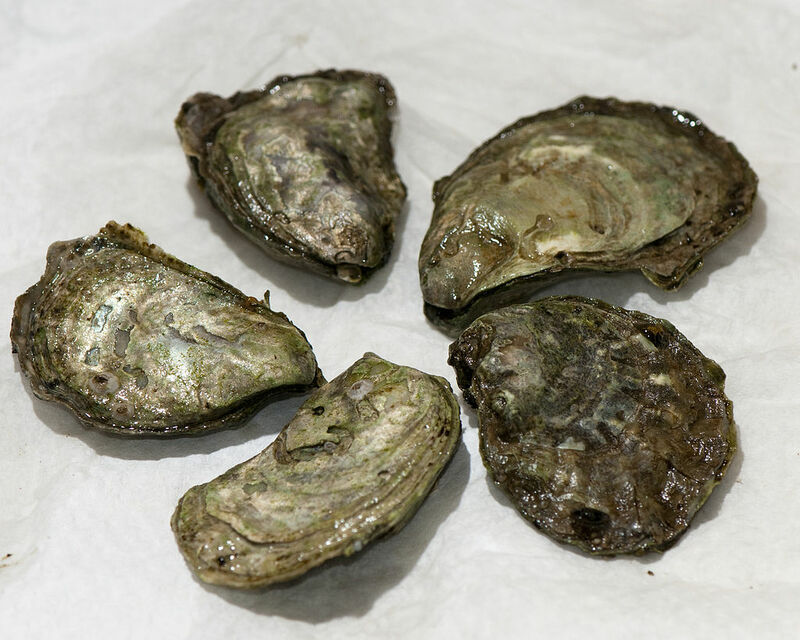 To test how Olympia oysters would do in open waters, the researchers grew baby oysters outside the brood chamber where they were exposed to acidified water, noted Matthew Gray, a former doctoral student in OSU’s Department of Fisheries and Wildlife. He is now conducting research at the University of Maine. It appears that a major difference in the development of Pacific and Olympia oysters lies in their reproductive strategies, including differences in managing their energetics. The research team found that energy stores in young Pacific oysters declined by 38.6 percent per hour, compared to 0.9 percent in Olympia oysters. Pacific oysters put their energy into building their shells seven times faster than Olympia oysters. The exposure to acidified water affects shell development. 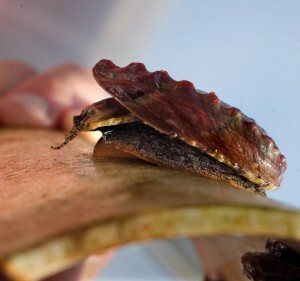 While the larval oysters may get through the shell-building stage, they often don’t have enough energy left to survive, Waldbusser said. The study, funded by the National Science Foundation, was published in the Journal of Limnology and Oceanography. Puget Sound Restoration Fund has been working for nearly 20 years to restore Olympia oysters at 19 priority locations throughout Puget Sound. The new study lends credence to the effort and support for a recommendation by the 2012 Blue Ribbon Panel on Ocean Acidification. The panel called for restoring the native oyster to Puget Sound to build resilience into the ecosystem, according to Betsy Peabody. The panel, appointed by former Gov. Chris Gregoire, called for maintaining the genetic diversity of native shellfish to provide the species a fighting chance against ecological changes brought on by climate change. Benefits of the Olympia oyster, including so-called ecosystem services, are described in an article by Eric Wagner in the Encyclopedia of Puget Sound. Healthy oyster reefs offer benefits such as cleaning up the water, protecting shorelines from erosion and increasing habitat complexity, which can expand the diversity of sea life. 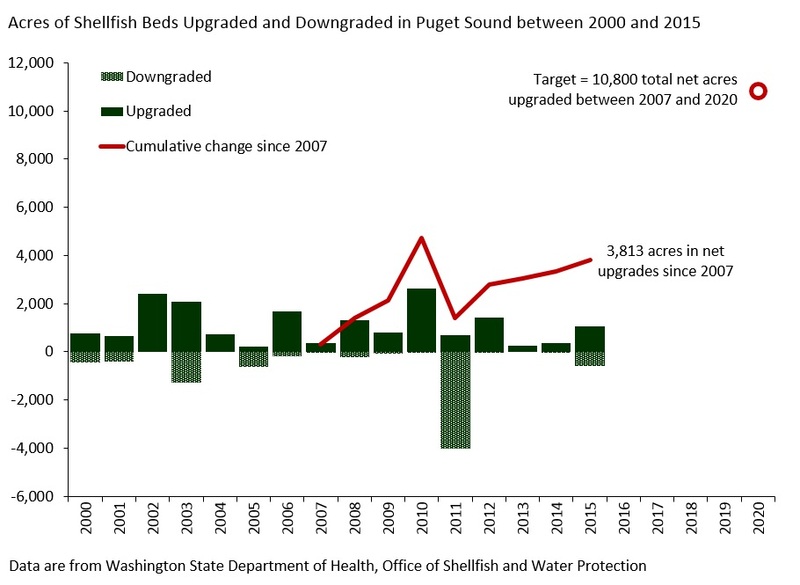 So far, Puget Sound Restoration Fund has restored 50 acres of shellfish to Puget Sound, working toward a goal of restoring 100 acres by 2020. Oyster hatcheries in Washington state underwent a temporary crisis a few years ago when Pacific oyster larvae were dying from acidified seawater pumped into the hatcheries. The water still becomes hazardous at times, but careful monitoring of pH levels has allowed hatchery operators to overcome the problem. When the water in an oyster hatchery moves beyond an acceptable pH level, operators add calcium carbonate to alter the pH and support the oyster larvae with shell-building material. Bill Dewey of Taylor Shellfish Farms said older oysters might be affected in the future as ocean acidification progresses. “We know things are going to get worse,” he told me. Because of their small size and high cost of production, Olympia oysters will never overtake the Pacific oyster in terms of market share, Bill said, but they are in high demand among people who appreciate the history of our only native oyster and its unique taste. The new research by Waldbusser raises the question of whether the highly commercial Pacific oysters could be bred so that their larvae grow slower and perhaps overcome the effects of ocean acidification. Joth Davis, senior scientist for Puget Sound Restoration Fund and senior researcher for Taylor Shellfish, said the market is strong for a smaller Pacific oyster, so most growers would not object to one that grows more slowly with greater survival. Meanwhile, efforts are underway to maintain the genetic diversity of Olympia oysters and other native species, as growers begin to think about cultivating more natives. Transplanting species from one area to another and boosting their populations with hatcheries creates a potential to override local populations and weaken overall genetic diversity, Joth said. Geoduck clams, which can be started in hatcheries and grown on a large scale, don’t appear to be genetically distinct from one place to another in Puget Sound, Joth said. Researchers have found some evidence that Olympia oysters may be genetically distinct when comparing one area of Puget Sound to another. But finding genetic differences does not always mean the population is uniquely adapted to that area, Joth said. Variations might relate to a random population that settles in a specific location. Sometimes it takes careful study to make sense of the differences. Rich Childers, Puget Sound shellfish manager for the Washington Department of Fish and Wildlife, said the state currently has no firm rules for transferring native species from one place to another. With growing interest in cultivating Olympia oysters, sea cucumbers and other native species, the agency is opening discussions about what kind of controls might be needed. Nobody was really talking about designating an official “Washington state oyster” until 14-year-old Claire Thompson came along. Now the state Senate has approved a bill, on a 47-1 vote, to list the Olympia oyster as the state’s official oyster. Claire is an eighth grader at Olympia’s Nova School, which requires a yearlong project involving something that students care deeply about and can make a difference. Claire, who hopes to become a marine biologist or oceanographer, developed a sense of history for the once-prominent Olympia oyster, as we learned from her testimony before the Senate Governmental Operations Committee. The full testimony on SB 6145 falls between 40:00 and 51:00 in the video on this page. “Pollution near historic beds caused many closures of the fishery and rallied the oyster farmers to fight for the earliest pollution control regulations for clean water and cleanup,” Claire told the committee. Ostrea lurida, the scientific name for the Olympia oyster, is the only native oyster to the region. The Pacific oyster, imported from Japan in the 1920s, makes up most of the production today, but the tiny Olympia is making a comeback as a unique delicacy with natural ties to the region. Claire talked about ocean acidification, caused by excess carbon dioxide in the atmosphere, and its ongoing threat to the ecological health of Puget Sound, Hood Canal and other bays and estuaries. Claire is the daughter of Rowland Thompson, lobbyist for Allied Daily Newspapers of Washington, who encouraged her to develop her project and speak before the Legislature. Jim Jesernig of Pacific Coast Shellfish Growers Association said he supports the bill, even though it came as a surprise to his group. The common green darner dragonfly, the official insect. Since then, Puget Sound Restoration Fund has helped rebuild native oyster populations in many bays, with one of the greatest successes in Liberty Bay near Poulsbo. Betsy Peabody, executive director, told me this morning that her group has great hopes for success in Dyes Inlet near Silverdale and in Port Gamble Bay in North Kitsap. A new oyster hatchery in Manchester is expected to be in operation later this year. Occasionally, I’m caught totally unaware of some bit of information that I come across in a newspaper or magazine. Such was the case with reporter Craig Welch’s story in Sunday’s Seattle Times, which was reprinted in the Kitsap Sun today. Abalone is being reared in a hatchery in Port Gamble for planting this summer. The story was about abalone, a mollusk that populates rocky reefs in various locations throughout our inland sea. I’ve been hearing about efforts to restore abalone populations, and I’ve wondered what happened to these creatures. After all, it hasn’t been legal to fish for them for 15 years. Thirty years ago, one-fifth of abalone were small. Today only 2 percent are. Average abalone shell sizes have grown larger. “We thought, ‘Wouldn’t poachers want the biggest ones?’ ” said Don Rothaus, a Fish and Wildlife biologist. Poachers weren’t taking more because abalone no longer clustered in quantities big enough to make it worth their while. So many abalone had been removed from Puget Sound that those remaining lived too far apart to congregate. They couldn’t get close enough to mate. After reading the Times story, I called Betsy Peabody of Puget Sound Restoration Fund to get the latest information on the abalone restoration program. She was the first to tell me about the abalone effort three years ago. It quickly became clear from our conversation that a lot has been happening with the involvement of people from all kinds of organizations. Craig Welch mentioned an abalone hatchery, which was built alongside Weston’s environmental laboratory in Port Gamble. Researchers are developing hatchery populations and working hard to make sure that they are not decreasing the diversity of abalone or introducing disease to native populations. An out-planting of the abalone is planned for this summer in several locations. Like the effort to restore Olympia oysters to Puget Sound (See Kitsap Sun, Oct. 2, 2006), the effort to bring back the abalone is expected to be long and involved — but at least it has started.